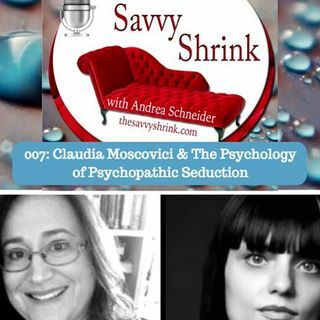 Claudia Moscovici, founder of Psychopathy Awareness Blog (psychopathyawareness.wordpress.com) joins Andrea Schneider, LCSW today to discuss the prevalence of psychopathy and the covert nature of this form of psychological abuse. She shares with listeners her expertise on how the public can be informed and protected from psychopathic (and narcissistic) abuse. Moscovici was born in Bucharest, Romania. At the age of 12, she immigrated with her family to the United States where she has gone on to ... See More obtain a B.A. from Princeton University and a Ph.D. in Comparative Literature from Brown University. Moscovici taught philosophy, literature and arts and ideas at Boston University and at the University of Michigan. Born in Bucharest, Romania, she writes from her experience of life in a totalitarian regime, which marked her deeply. In 2002, she co-founded with Mexican sculptor Leonardo Pereznieto the international aesthetic movement called “Postromanticism”, devoted to celebrating beauty, passion and sensuality in contemporary art. She wrote a book on Romanticism and its postromantic survival called Romanticism and Postromanticism, (Lexington Books, 2007) and taught philosophy, literature and arts and ideas at Boston University and at the University of Michigan. Most recently, she published a nonfiction book on psychopathic seduction, called Dangerous Liaisons (Hamilton Books, 2011) and a psychological thriller called The Seducer (forthcoming in March, 2012), which tells the story of a woman lured by a dangerous psychopathic predator.